Z is for Zeb Bakes and for Zucchini Chocolate Cake, the cake of the season, I am sure everyone who has either grown or been given zucchini has made a version of this cake this month. I made the justly famous Chocolate and Zucchini blog version of this cake, recipe here, using less sugar and going for the butter option rather than the oil. My version is here. I have to confess I don’t like the mouthfeel of cakes made with oil one little bit. I’ve tried several different recipes and have yet to find one that I think is as nice as a cake made with butter. Anyway this cake is delicious and messy while still warm with all the chocolate chunks and it’s still moist and yummy four days later. It keeps really well and I will definitely make it again when I have shed a few pounds. It amuses me to think that it is somehow ‘healthy’ because it’s got courgette in it. Personally I don’t believe it for a minute! I also made Zeb’s birthday cake which he shared with his sister and all his doggy friends down at the Woods. 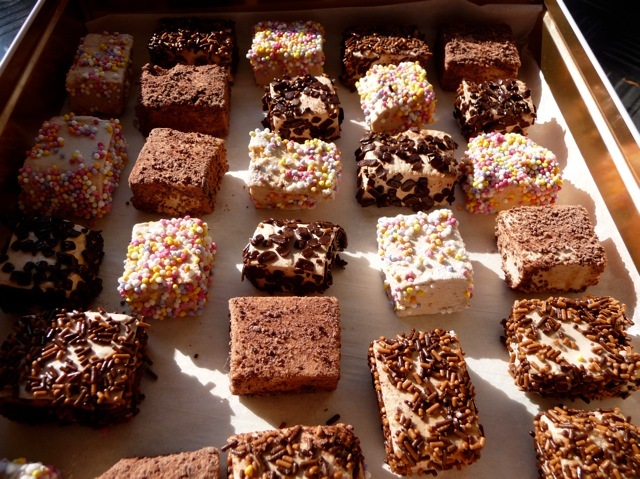 I felt like the Pied Piper after a day of doling out cubes of liver cake. One of Zeb’s mates is Lenny, who thinks he is a whippet and is always charging around. Like all hounds he has an incredibly sensitive nose. Lenny careened past me on a mission at the top end of the football field and then turned delicately on one of his Charlie Chaplin feet and spun back when he caught a whiff of a molecule of this cake and gave me that special look. It’s an extraordinarily effective treat for reward based training. Zeb got more and more cross as I gave ‘his’ cake away. He started going up to people and demanding them back. Dogs have no sense of ‘sharing’ when it comes to high value foods. If anyone wants the recipe for this do get in touch. And finally, and these may be the last cakes I bake for a good long while, as I am going to cut back on all sorts of things for the next few months and try to be healthier, chiefly by eating less overall and cupcakes are definitely not going to be on the menu, but just for fun and to say thanks to you all for encouraging me, here is a batch of the Hummingbird Cook Book Vanilla Cupcakes. Thank you all – it’s been great fun! To all of you who took part in the Q and A photo quiz up to 29th August (the end of my alphabet) – I’d like to send you a box of these easy-to-use chocolate letters and numbers to make your own words and have your own alphabet fun. I still have three boxes left to give away so if you would like to have a go at winning one of those, all you have to do is rearrange the letters in ‘Zeb Bakes Alphabet in August‘ by the 31st August. I’ve had a couple of goes but maybe you can do better? I will send them anywhere. I also have four packets of cannoli (four in a pack)i molds to G1ve away, if you would like to try your hand at making those, don’t hang about, get anagramming! There aren’t any particular rules, but you can’t use letters that aren’t there. If you can’t use them all, don’t worry! I’m going to give the job of judging to Brian. The first one was an attempt at making Swedish rye crisp bread, aka knackebrød, using this fantastic rolling-pin that Barbara brought me when she visited earlier this year. No one guessed that, but I enjoyed your suggestions very much! The second one was marshmallows, made with sugar and gelatine. I think most of you guessed that one. 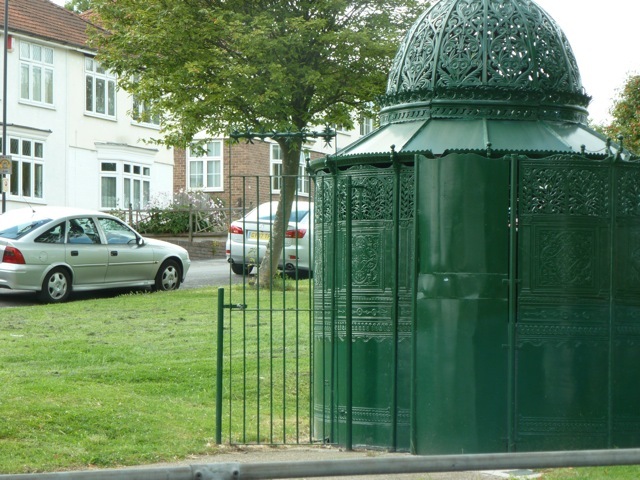 The third object was (several of you figured this out) an Edwardian public toilet near Golden Hill, North Bristol. Miskmask not only figured this out but sent me this wonderful link to the CIBSE Heritage Group which not only had pictures of this one before and after restoration but loads of great info and pics of all the other ones that have been photographed. So a big thanks to you Miskmask for that superb piece of research! A final Z is for our Zoo with their real gorillas on their island. And the Wow! Gorillas who have definitely helped me burn a few calories this weekend again as we tore around the city on foot visiting a dozen or more that we hadn’t got round to. One of the things about cities with ever more complicated road systems is that it really is often so much quicker to walk, or cycle or drag your poodle than it is to get in your car. And on foot you see so much more, you can admire the lovely flowers the council have put out on the road crossings and see views of buildings and the river cutting through the city that you simply never see when you are driving. It’s been illuminating discovering corners of the city that I didn’t know at all. Zeb Bakes is having a little break now! See you soon and a Zillion Thanks for your Company this summer. Brian says all your anagrams are great and he can’t choose so for everyone who played and who indicated they would like a set I will send them out. If you wouldn’t mind sending me your address then I will pop them in the post. I think you all have my email address as I have commented on your blogs. If I have missed you out, I’ve tried to be organized but it’s not my strong point… do please let me know! 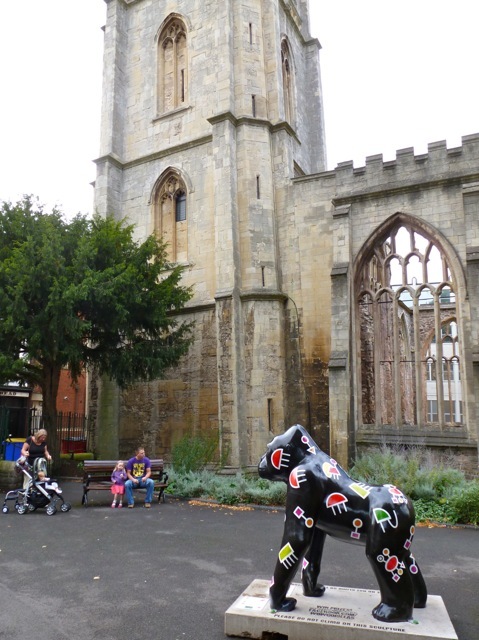 Might have tea at the Avon Gorge Hotel tomorrow, there’s a gorilla there…. Push a tile, gaze at kebab buns. Grammatical, even if it doesn’t make complete sense, and I think it uses all the letters :) If Brian likes my entry, I’d love a pack of cannoli molds! what a brilliant end to your A-Z challenge. Hoorah, let them eat cake! COngrats on finishing this alphabet marathon, you showed incredible endurance! I have one of those rollers- I used it to make a gingerbread roof for a cottage! I will have to make the crisp rye bread now. Of course, it’s a gingerbread roof roller… now there’s a tongue twister Heidi ! Congratulations on finishing the alphabet in such a fine way! Have a nice break, hope to see you back soon. Ha ha, what fun. No wonder you need a break though, you’ve put a lot of work into your alphabet. So pleased there is a chocolate cake to accompany Zeb’s doggie cake, I might have been a tad disappointed otherwise. Playing around with word’s is not my thing, but the chocolate alphabet looks great, especially on those cupcakes. Hope you have a good and healthy break. Love Lenny! And the liver cake. As for ‘doing’ healthy – I don’t believe anything that is covered in chocolate could possibly be unhealthy – could it? I loved your yellow slide show in the previous post – yellow is my happy colour. I like to have bits of it around. I shall miss you very much while you’re away but wish you a very happy break; we’ll all be wagging our tails when you come home. Jan! You had disappeared into the spam folder (Aksimet! How dare you put Jan in the spam, naughty, no liver cake for you!). We have such fun with our doggy friends, some of whom are wildly entertaining like the lurching Len, the bouncy Bonnie, the very small and the very tall. Dog walking is one of the most social activities I take part in, a moveable wagging extravagansa. There is an old New Yorker cartoon which my Dad sent me when he thought I was getting too ‘doggy’. 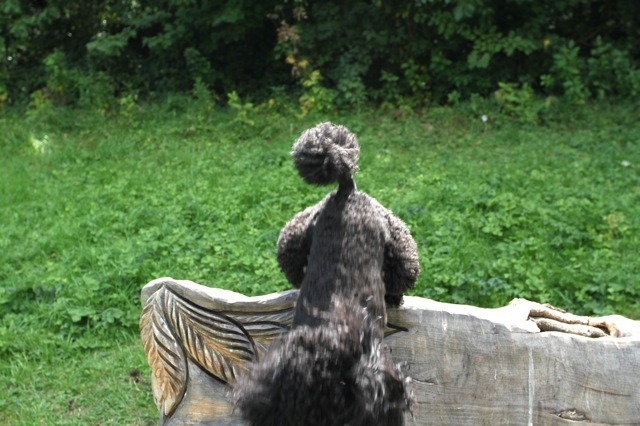 In it a woman stands next to a man in a park, both have dogs, her t’shirt reads “Go on, Ask me about my Dog!”. It is one of those paradoxes of modern life. The one where we ignore people on the street, but put the same people on a path through a bit of urban woodland and they will say ‘Good Morning’. People talk to you if you have a dog, it’s all good. I’ve really enjoyed your alphabet series – especially the lovely pictures of Zeb in this post. Please, I think Spot would like the recipe for his cake! I’ll miss you – have a good break but come back soon! I was hoping someone would ask….brace yourself for the gentle perfume of liver baking in the oven…. Take 500 grams of liver (I use lamb liver) , puree in blender. mix with about 300 g of flour, or more if you want it to go further, (you get different results depending on whether you use self raising or plain, I did selfraising one time and it really did rise and look like cake!) add an egg and about half a pint of milk or milk and water. You may need more liquid, until you get a medium thick batter, thicker than pancake batter, more like sponge cake mix. If you think Spot will appreciate it add some dried mixed herbs. 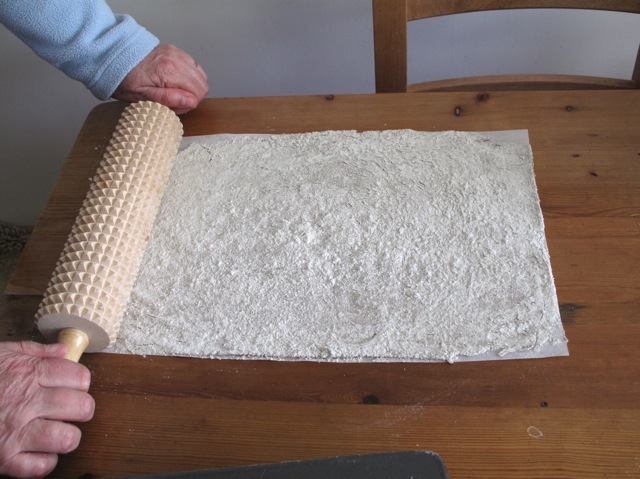 Then line a baking tray with silpat or baking paper and pour the batter on to it. Bake in a medium oven, say 140 C, for about 40 minutes. Leave to cool and deflate, peel off paper, cut up and freeze in chunks. Don’t let him have too much at one time as it is quite rich but highly motivating! You know that is not Zeb with the chocolate cake don’t you? It’s a little teeny toy poodle someone gave me! Thanks Joanna, that sounds like perfect Spot reward material! I’m just about to go shopping so will add liver to my list. Actually I quite like liver myself though my husband hated it – he couldn’t get past memories of the boarding school version which had the texture of an old tennis ball. Yes, I thought that didn’t look like Zeb with the cake. I love the “beginning and end” pics – clever of you to get just the right ones! We have liver from time to time, depends on where you can source it from. I rarely buy it in the shops. I get half a salt marsh lamb about once a year from someone who raises sheep in Wales, we are eating less and less meat these days, and this year I had the liver too. The photos? I fit the posts to the photos usually, when I try to take photos for a post it often doesn’t quite work, especially doggy ones ;) I got lucky with these ones the other day, Zeb loves climbing on structures. Zeb reminds me of a black standard that I used to dog sit for weeks on end. Her name was Fay and she was a princess. Good memories. My anagrams aren’t in sentence form, but they sure where fun to play with. I got out my bananagrams game tiles and played and played. I took some photos to send you went I get home Wed or thursday, I will have to check on the side to see if your email is listed. One lay out I did in bananagram style (like a scarbble game). Be a subtle gust in a bake phaz! Enjoy a break, I’m needing to catch up with MB! summer is fun and routine is out! I’ll pick up a canolli sometime! Just a day late. Sorry! 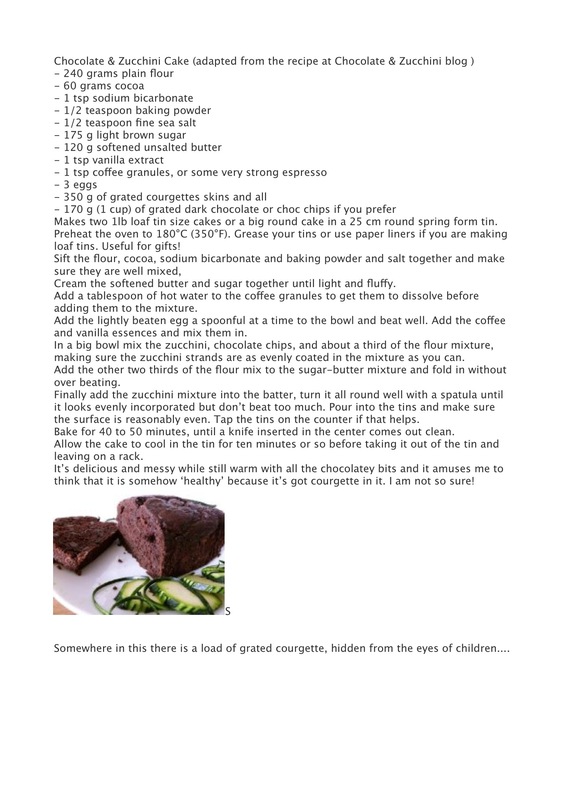 I’ve added a link and uploaded my version of the chocolate zucchini cake in the post above.